The art of the perfect teen movie: We in the Good Ol’ US of A have been gifted with some fabulous choices; from the Flapper films of the 1920’s, to the in praise of the juvenile delinquent 1950’s Rebel Without a Cause and Blackboard Jungle, the 60’s with their vacillations between the innocent beach party movies and then-shocking dares-with-yes films like A Summer Place. My favourite period for teen films was the 80’s, with the advent of MTV more attention was paid to the tastes of the teenage demographic than anytime since Frankie wowed the bobbysoxers at the Paramount. The 80’s teens had their own Frankie, and he say Relax. The unequivocal Pied Piper of the 80’s teen film was a fella out of Chicago named John Hughes. I believe he was in his mid-30’s when he wrote and directed first paean to teenagerdom, 1984’s Sixteen Candles, followed by The Breakfast Club and Pretty in Pink (- which he wrote, but didn’t direct) and several other testaments to teenage angst. What sets John Hughes films apart from other films aimed at teenagers at that time (- and Lord Knows there were many, from the heights of Heathers, Valley Girl, and Better off Dead, to the dregs of the Allnighter, and –despite guest starring Johnny Depp’s nekkid bum – Private Resort), is his regard for his subject matter. His comedy could be broad and his films weren’t filled with heart stopping plot twists, but he never underestimated the intelligence of his teenage characters, or his equally youthful audience. For once, a film maker “got” the kids. His movies were essentially tried and true fairy tales where the redheaded, befreckled heroine got her Jake, Bender, or Blane, Ferris got his day off without getting caught, and Keith finally understood that Watts was the perfect girl for him all along. John Hughes, with his snappy dialogue and brilliant soundtracks made the youth market seem like for some 90 minutes, it would be entertained, but it wasn’t going to be patronized. It’s no wonder that Linda Linda Linda put me directly in the mind of those 1980’s John Hughes films. It is a refreshing look at Asian teenagerhood that bears none of the hopelessness and sexuality of 1997’s Bounce KO Gals, or the violence and nihilism of 2000’s brilliant Battle Royale. 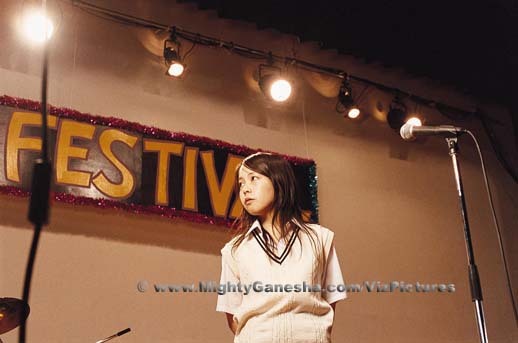 The premise is, like in the Hughes films, a simple one; after the loss of their lead singer, can the remaining girls in an amateur rock band (- Played by Yu Kashii, Aki Maeda and Shiori Sekine) pull off acquiring a new lead singer and learning three new songs before the big high school festival? Adding to their troubles is the only person available to sing lead is a Korean exchange student (- Played by Bae Doo-Na) with only limited Japanese, who has to learn the song lyrics phonetically. 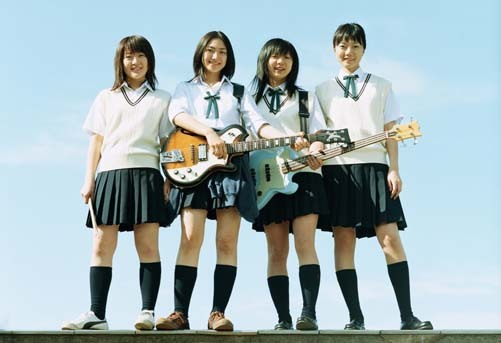 The title of the film is the name of one of the three songs the girls intend to cover by a 1980’s Japanese punk band called The Blue Hearts. The girls’ pure pluck and their determination to make it to the show; traveling miles away to available studio space for daily rehearsals, staying up until all hours, and putting their burgeoning love lives on hold for the sake of the band, absolutely catches you up and makes you root for them as they grow more confident as bandmates and closer as friends. The film is not particularly heavily dialogued, but the few pearls that we get are intelligent and occasionally hilarious. The cinematography is mostly done in a documentary style which gives you a fly-on-the-wall sense of authenticity. The acting is very solid throughout and Bae Doo-Na’s performance in particular. was a standout. As Son, the Korean exchange student, her expressive face tells us everything her limited vocabulary won’t allow. Her performance reminds me of Charlie Chaplin’s Little Tramp in her ability to relate her feelings of isolation, befuddlement, amusement and joy without use of words. The film’s finale is a pure joy. This is easily one of my favourite movies of the past year (- though it was released in 2005 in Japan – We get everything last!). Everything from the premise to the mesmerizing soundtrack by James Iha (- who I believe was a farmer before his foray into music, I understand he had something to do with pumpkins) to the performances is just perfect. 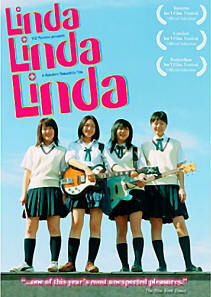 It’s a sharp and refreshing film; I defy anyone who sees Linda Linda Linda to not want to immediately start a band or wonder why you didn’t start one in high school. Director Nobuhiro Yamashita never dumbs down or plays his characters cheap, and consequently neither does his audience. He allows the sensitivity, sweetness and determination of his teenage characters to shine through without ever getting mawkish or cliché. He “gets” them, and gives us, as viewers, insight to this secret and endangered race known as the teenager, very much like that Hughes chap I was chatting about a while ago. I can’t wait to see Yamashita’s next film, but in the meantime, I urge everyone who might be lucky enough to catch Linda Linda Linda as it slowly wends its way through limited release, to get your blessing. You’ll thank me. PS: Just found from the fine folks at Viz Media that LLL is coming to a very fortunate DVD player near you on April 7th, 2007. Grab yourself a shiny, round disk o’ joy! 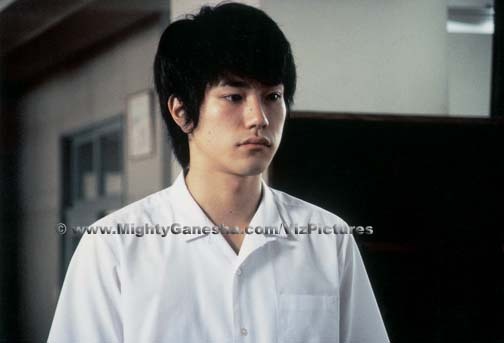 Update - Oct 8, 2007 - Hey Girls and Boys, check our news page, ...and Nonsense, for info about the live action version of Death Note, starring the adorable Kenichi Matsuyama, who plays Bae Doo-Na's Korean speaking unrequited love in LLL. 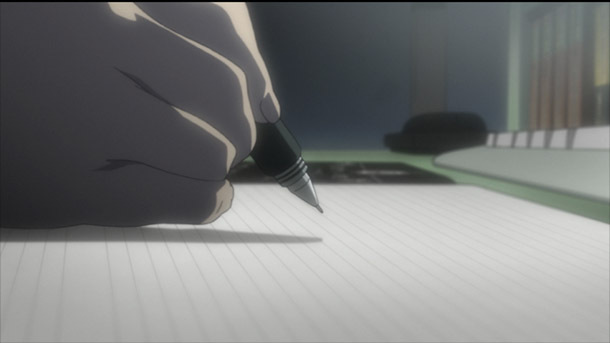 Or, click on the Death Note logo!